There is not a McDonald’s, truck stop, or rest stop every 25 miles, so you might want to go easy on the liquid intake. Carry your own toilet paper (“loo roll”) because when you do find a place to use, the facilities might look like something from the backside of a U.S. National Park that the rangers haven’t cleaned up or restocked lately. Don’t assume that a clean restroom means there will be running water. I’m still not sure what the protocol is for this situation, but my preference, upon discovering a toilet will not flush after I’ve used it, is to leave as quickly as possible with my head held high and my travel-size hand sanitizer clutched in my hand. 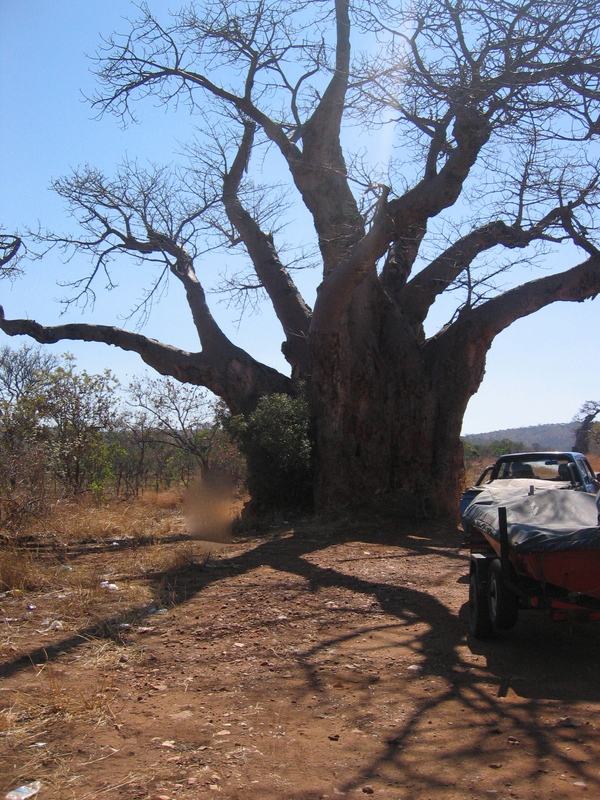 Sometimes a baobab tree is as good as it’s going to get. Try to situate yourself away from any oncoming traffic and check the area for wild animals. This is known as “the Big Tree” because it is big and everything around it is small and scrubby and offers no real cover from passing traffic. I can’t tell you how badly I needed to go, but I crossed my legs and prayed that Makuti and its dodgy but serviceable loos would appear on the horizon sooner than I knew possible, while my braver companions made use of these more natural facilities. On the list of things we won’t speak of: the amount of loo paper surrounding its base. It’s a popular spot. Road trips in Zimbabwe are different than they are in the U.S. Though I first read the motto “the journey is the destination” in a book about Africa (Dan Eldon’s illustrated journals, which are not to be missed), it is a road trip motto that I am more comfortable with in an American context, where there is a seemingly endless supply of pecan logs from Stuckey’s, giant balls of twine, and outlet shopping. Here, you climb in the car with a cooler at your feet full of cheese sandwiches and Cokes, and you drive and drive and drive until you get where you are going. On the drive home, we reversed through the landscape that had haunted me on the way up. Even more of it seemed to have burned up while we’d been enjoying Kariba. Eventually we made it to a place called Lion’s Den. This is the name of an actual town and not a restaurant or a game park, like I thought, though what is there mostly is a good restroom (sorry the water isn’t working), a place to buy good biltong (like beef jerky—a family favorite that I skip because it isn’t “jerky” enough), and a great gravel parking lot for the brother-in-law to change a flat tire he didn’t know he had until he got a hankering for biltong. On the drive we’d gone through three police roadblocks, where we were waved through in our vehicle, but the brother-in-law was pulled over because there was something irresistible about the fishing boat he was towing. (The purpose of the roadblock has yet to be explained to me in a satisfactory way, but because I was raised during the Cold War with stories of Checkpoint Charlie, my posture always improves when we approach one.) Later, on a nearly deserted road, we passed a policeman with a radar gun. Again, not entirely sure what the purpose of that was, since we were the only car on the road and it wasn’t a road you could go particularly fast on because of potholes, not to mention the rogue cows and goats, who roam about freely. We drove through Murombedzi, which I was told is a “Growth Point.” I had big expectations. Something that had grown out of control, perhaps, but instead, what I saw was a few shops, a bottle store, a grain depot, ZimPost, some more goats, and a jacaranda tree that was beginning to bloom. It turns out “Growth Points” were really just places in rural areas in the 1980s that got designated as such so rural people wouldn’t have to travel to larger towns for needed services. Interesting. About an hour from Z’s hometown, the trip was starting to feel unbearably long. I’d lost the ability to ohh and ahhh at balancing rocks (so cool) or the roundy, thatch-roofed huts (exactly how you want places in Africa to look), or even the joy of uncontained livestock leaping in front of your vehicle. So I suggested we play the alphabet game. You know the one, where you find an “A” on a billboard and then move on to a road sign with a “B” on it. When you get to “Q” you pray for a Quick Lube or a Quality Inn. Perhaps the best thing about a long road trip—aside from the joy of good plumbing—here or there, is that if the journey is long enough, you are so happy to arrive home that you forget how sad you were to leave whatever hunk of paradise you just left.